Between the 15-16 June 2018 a n the beautiful Chateau Belá, in Slovakia, co-organised by the Hungarian and the Slovak Grand Priories. 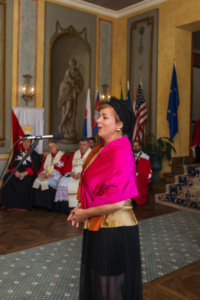 It was the 14th time that the Order had its knighting ceremony in the “Most Romantic Chateau of Europe” (2013), attended by postulants and guests coming from 25 countries (Slovakia, Hungary, Portugal, USA, Angola, Malta, Czech Republic, Turkey, Germany, Macedonia, Italy, Austria, Croatia, Serbia, Hong Kong, Singapore, Benin, Ukraine, Congo-Brazzaville, France, Sierra Leone, Laos, Thailand, Montenegro, Sao Tome and Principe) of 4 continents (Europe, Asia, Africa and America). – Handing over the Postulant Diplomas and the Code of Chivalry. Sir Werner Tewes from Germany – Knight of Cyprus, Founder and President of Hall of Fame of Martial Arts Europe – used this special occasion to present to H.G. Sir George Popper the title “Honorary President” of the Hall of Fame. The 2-hour General Chapter of Knights meeting was followed by an ancient and very intimate knightly tradition, inherited from our great predecessors: The Watch of Arms, when the postulants got acquainted with the symbols, they will receive while being knighted, the customs and rules of the knights that they have to respect and preserve, by meditating on their future after this important event in their life. In the evening a celebratory Gala Banquet awaited the attendees with joyful music. The delicious menu was prepared by the new chef and his staff of the Restaurant in Chateau Belá. 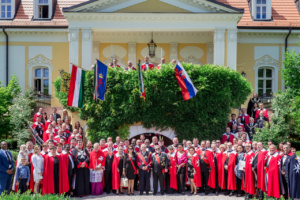 After marching in of the postulants, the knights and dames, the high officers, entering of flags and knighting swords, and listening of the Anthems of Slovakia, Hungary and the Order of Malta, the audience was greeted by the Grand Master, Prince José, with special attention to the guest of honour: H.E. Rodolphe Adada, Ambassador of the Republic of Congo to France and the high-ranking delegation of CSLI, headed by H.E. 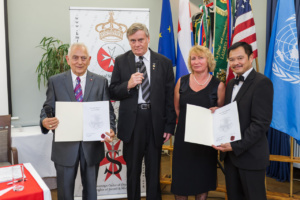 Senator Wolfgang Steinhardt, President of Lazarus Union, Grandmaster of the Knighthood of Honour of the CSLI from Austria. Remembering the knights who passed away – Sir Pavol Christov, Knight of Malta (Slovakia) and the owner of Chateau Bela, Ilona Elisabeth Gabrielle Gräfin von Krockow, also praying for the recovery of our ill members, and this time we could listen Pie Jesu, composed by Andrew Lloyd Webber, performed by Lady Lívia Ághova, famous soprano of the Prague Opera. – Most Rev. Monsignore Fabio Fabbri, Prelate of His Holiness the Pope, Magisterial Chaplain of the Order, Member of the Board of Religious Counsellors and Interfaith Pluralism, Grand Prior of the Italian Langue handed over the Blessing of Pope Francis to the Grand Master, Prince José and his Family.- H.E. Senator Wolfgang Steinhardt (Knight Commander of Cyprus) was awarded with the “Gold Star with Diamonds” of the Sovereign Order of Cyprus. – Sir Fra. Pavol Zemko, King of Arms of the Magisterial House and Lady Ivona Matúsova presented to H.G. Prof. George Popper and his family the official Registration of the Coat of Arms of the Popper Family and the Act of Nobility by the Slovak Heraldic Council and the Ministry of Interior of Slovakia. – The “Grand Cross of Security” awards of the Order of Security were given to the following Members of the CSLI leadership: Chev. Ludwig Brunner, Chev. Oliver Gruber-Lavin, Chev. Josef-Maria Gebel, and Chev. Werner Winkelhofer. Lady Lívia Ághova – by singing Tosca’s prayer with her outstanding voice – was able to touch our souls and prepare the postulants for the coming investiture. This time eighteen worthy candidates were admitted to the Sovereign Order of Saint John of Jerusalem, Knights of Malta and one postulant to the Sovereign Order of Cyprus, from 12 countries, under their merits and human qualities, on the recommendation of 2 Knights or Dames, as their godfathers and godmothers. The knighting ceremony was administered by H.M.E.H. Prince José, the Grand Master of KMFAP and the Lieutenant General H.G. George Popper, assisted by the Master of Ceremony, Sir Peter Stangl and many other Knights and Dames, who did their best this time again. According to our traditions the Grand Master gives awards of advancements of ranks and incentives to those members who deserve it with their outstanding work for the benefit of the Order and helping the needy to make a difference. At the end of the ceremony the Speaker expressed gratitude on behalf of the supreme leaders of the Order and conveyed sincere congratulations to the knights and dames, who contributed with their devoted work to the success of the 35th investiture held in excellent cooperation of the Slovak and Hungarian Grand Priories. After the group-photo session in the beautiful park of the Chateau and before heading to Budapest, the knights, the investees and the guests were invited for a lunch. The 2-day-event was topped by the 23rd Ball of Knights and Bodyguards at the Ballroom of Hotel Marriott, famous for its breath-taking view on the city of Budapest and the majestic Danube river. We felt privileged and were delighted to welcome the Ambassador of Indonesia, the Ambassador of the Philippines, the Ambassador of Bosnia and Herzegovina, the Ambassador of Moldova, the Ambassador of the Republic of Congo to France, the Honorary Consul of Gambia in Hungary and many other high ranking guests, who accepted our invitation to our event. After the official opening of the Ball by the hosts, H.G. George Popper and Prince José, a cake cutting ceremony took place at the podium. By this we intended to commemorate a decisive historic event occurred in the long history of the Knights of Saint John. 220 years ago – as it was written on the top of our delicious brand cake, which is the favourite of our knights, made by Café Művész – in 1798 the French Army lead by Napoleon invaded Malta, and the Knights of Saint John were expulsed from their island, their state, their home, that they ruled for 268 glorious years, building a well organised and well-functioning state with all institutions, gaining by this the admiration of the whole world. By this tragic event a new chapter of the history of the Knights of Saint John (Knights of Malta) started, and Malta was never returned to the knights.The Maltese Islands (and Tripoli) were granted to the Knights of Saint John in 1530 by Charles V, King of Spain and Holy Roman Emperor, following the loss of Rhodes. All along the entertaining program the Ball audience applauded the musical performance of the world-famous violin virtuoso Roby Lakatos, awarded with the Gold Medal of Merit of the Knights of Malta (KMFAP) last year. It was a great evening with nice dinner and music, dancing, other artists’ performances, fancy studio photography session, with the inevitable cigar corner, cocktail bar and with a lot of fun. This unique event with its elaborated details was an extraordinary experience for all participants by leaving deep emotions and unforgettable memory in their hearts.